For other uses, see Follis (disambiguation). 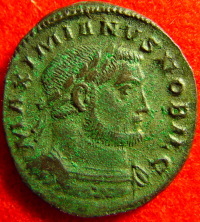 A follis of Galerius as caesar. The follis (plural folles; Italian: follaro, Arabic: fels‎) was a type of coin in the Roman and Byzantine traditions. Fourth century folles represent the largest category of coin finds in the United Kingdom. The follis was reintroduced as a large bronze coin (40 nummi) in 498, with the coinage reform of Anastasius, which included a series of bronze denominations with their values marked in Greek numerals. A 40 nummi coin of Anastasius is depicted on the obverse of the Macedonian 50 denars banknote, issued in 1996. The fals (a corruption of follis) was a bronze coin issued by the Umayyad and Abbasid caliphates beginning in the late 8th century, initially as imitations of the Byzantine follis. ^ National Bank of the Republic of Macedonia. Macedonian currency. Banknotes in circulation: 50 Denars Archived 29 March 2008 at the Wayback Machine. — accessed on 30 March 2009. Wikimedia Commons has media related to Follis.